When New England heads to San Diego this week for one of Sunday’s most intriguing games it will be a little bit like two high school sweethearts that hadn’t seen each other in a really long time running into one another at the mall. It was just two scant years ago that these AFC juggernauts were meeting in the conference title game. The Patriots were two sweet sips of victory away from the Greatest Season of All Time and the Chargers were a worthy impediment on the end of a 46-18 four-year run. But since that fierce game in Foxboro these two franchises have found the fight to be a little tougher. Neither team has won a playoff game in the two seasons since and neither currently leads its division. Most of the best players from that AFC Championship Game are no longer with these teams and both appear in the midst of a rebuilding effort. New England will face San Diego at 4 p.m. EST on Sunday in Qualcomm Stadium. The Chargers are in a desperate spot at just 2-4 overall while the Patriots enter this clash off an emotional comeback win in overtime last week against Baltimore. The Chargers, despite their substandard record, are slim three-point favorites. San Diego has been one of the bigger surprises of the season and right now represents somewhat of a statistical anomaly. They are mired in a three-way tie for second place in the AFC West and have the league’s No. 25 record. But they have reached that bottom run despite boasting the No. 1 offense and No. 1 defense, as well as outgaining their opponents by a nearly 1,100 yards and outscoring them by 31 points on the year. The Chargers have been crippled by monumental special teams meltdowns, penalties, turnovers, bad karma from holdouts, and a 0-4 record in games decided by one score or less. What makes things worse is that none of the teams that the Chargers have lost to managed more than five wins last season. Critical errors at crucial times have plagued this notoriously slow-starting franchise so far in 2010, and with a tricky schedule and improved divisional opponents on the road ahead there are very real questions about this team’s immediate future. Things are much more stable for the Patriots. They have one of the best records in the league at 4-1 and are off a big win over the Ravens. However, they recently traded their most dangerous offensive weapon (Randy Moss) and they are currently shackled with the league’s No. 30 total defense and No. 25 scoring defense. The Patriots play three of their next four games on the road and still have difficult matchups with powers like Pittsburgh, Indianapolis and the Jets left on the schedule. San Diego is in desperate need of a win to keep them from sinking further into their self-dug hole. But they may have to play one of their toughest games of the year without one of their key players. Antonio Gates will be a game-time decision and could see a streak of 85 straight games snapped. Ryan Matthews, Malcolm Floyd and Legedu Naanee are also banged up on a Chargers offense that should have been able to exploit New England’s shoddy secondary. Naturally, the public is all over the Patriots this week. Whether it’s the injuries or San Diego’s stunningly suspect record this year, there apparently aren’t a lot of believers in Norv Turner’s bunch. More than 80 percent of the early action has come in on the road underdog as bettors are gladly taking Tom Brady, Bill Belichick and the healthier team along with a spare field goal. The underdog has been the play in this series. The dog is 5-2 ATS in the seven meetings since 2001. Also, the travel has been a factor in the last several meetings, as the home team has posted a 3-0 straight up and 2-1 ATS record. The last time these two played was in 2008 and the Chargers laid a 30-10 beating on the Brady-less Patriots. The Chargers are a stock favorite at -3.0. This line has quivered this week, with some books dipping to -2.5 and then generally being snapped back up to -3.0. The total represents the highest number of the weekend at 47.5. That is actually down from an open of 48.5. Chargers are 21-10-3 ATS in their last 34 games following a S.U. loss. Chargers are 2-5-1 ATS in their last 8 games overall. 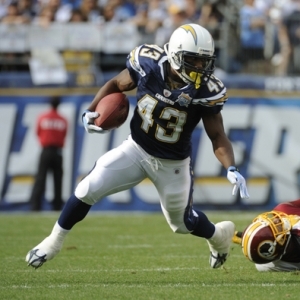 Chargers are 2-7-1 ATS in their last 10 games as a favorite. Patriots are 13-6-3 ATS in their last 22 games as a road underdog. Patriots are 23-11-3 ATS in their last 37 games as an underdog. This game is definitely a “stay away” for me. I haven’t had a great read on the Patriots over the last several years in matchups like this and it’s way too easy to simply take the points and rely on Brady and Belichick to stick it to the Bolts one more time. In fact, if I had to make a play I would bet with the books on this one and take the Chargers. They are simply the more desperate team and it is never a good sign to see over 80 percent of the public on an underdog in any sport. Further, I think that I would fade the public by going with the ‘under’ in this one. San Diego’s offensive issues are just too wide reaching to ignore. Their depleted receiving corps would have lit up the Patriots if they were healthy. But they are not so you can’t expect the same level of output. Also, without Randy Moss the Patriots offense is a bit less explosive. I can see them committing to the run even more – although at any key moment the ball will be squarely in Brady’s hands – and the short-passing game will be even more important in their game plan. It is tough to “bet against” two masters like Philip Rivers and Brady. However, the San Diego defense is one of the more underrated groups in the league and I predict another strong performance. I think that San Diego manages to stay out of its own way for 60 minutes and come away with a 23-19 win. Robert Ferringo is a writer and a professional college football and NFL handicapper for Doc’s Sports. He has banked $6,000 in profit for his clients after four straight winning football weeks and is rolling out more college football and NFL picks this week. He has brought in over $14,000 in overall profit in all sports over the last two-plus months. He has a Big Ten Game of the Year on the card this week and he’s looking for more profit today. You can sign up for his college football and NFL picks and get more information here.